Many Ohio manufacturers are frustrated by rising delivery costs from their electric utility. These costs are unavoidable even if shopping for generation service and allow little control as they are set through the PUCO rate-making process. In order to control such costs, manufacturers are looking more and more to distributed generation (DG) as a solution. So what is it and how could it impact your facility? 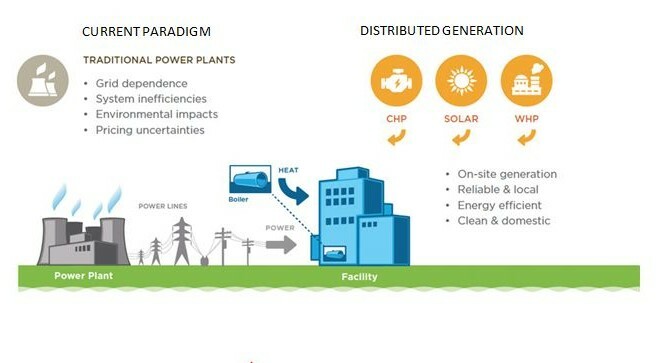 Our current energy paradigm consists of large central power plants generating the energy, high voltage transmission lines moving the power over long distances, substations reducing the voltage so distribution systems can deliver the energy to the end user. Contrary to this system, DG decentralizes the generation by locating it near the end user, often behind the electric meter. The scale can be quite small from1 kW up to very large systems in the 100’s of MW’s and can vary by technology: combined heat power (CHP) systems, solar, reciprocating engines, wind turbines, fuel cells, and batteries. Each technology comes with its own set of efficiencies, space requirements, and of course capital costs. Installed costs for DG systems vary by technology and size. Just to give a quick example of this, solar installations can range from $2,000 to $6,000 per kW, wind can range from $2,000 to $8,000 per kW and CHP can range from $1,500 to $8,000 per kW. The benefit of DG is the reduction in energy going through the utility meter and therefore, significantly reducing total energy costs and reliance on the grid. Even though energy independence is attractive, the challenges of DG exceeding ROI hurdles can be considerable. Properly modeling the economics of desired DG technologies to your specific facility is paramount. On the benefits side of the ledger are reductions in energy, capacity, utility distribution costs, renewable credits (if applicable), and tax incentives (if applicable). On the costs side of the leger are generally financing, fuel (if applicable), O&M, and standby/backup charges from the utility. In order to reduce capital requirements, manufacturers can engage a third party developer to own and operate the DG system. In most cases, the third party will require a long term power purchase agreement of 10 to 15 years which can reduce price volatility but can come at a cost. The bottom line for DG is, well, the bottom line. Manufacturers in Ohio have made of these projects work either on pure economics or to meet corporate renewable energy goals. Obviously nothing is constant and as costs in the current energy paradigm rise, DG has the potential to provide economic gain and increased energy independence.